In most residential and office locations, smoke detection offers a sensitive, reliable and cost-effective means of detecting fires in their early stages. However, in many industrial settings, where the risk of fire may be much greater, the presence of dust, draughts and variable light levels can pose serious obstacles to reliable smoke detection, not to mention the potential for the environment to adversely affect the detectors themselves. In these applications, infrared (IR) flame detectors can provide rapid fire detection with high false alarm immunity. 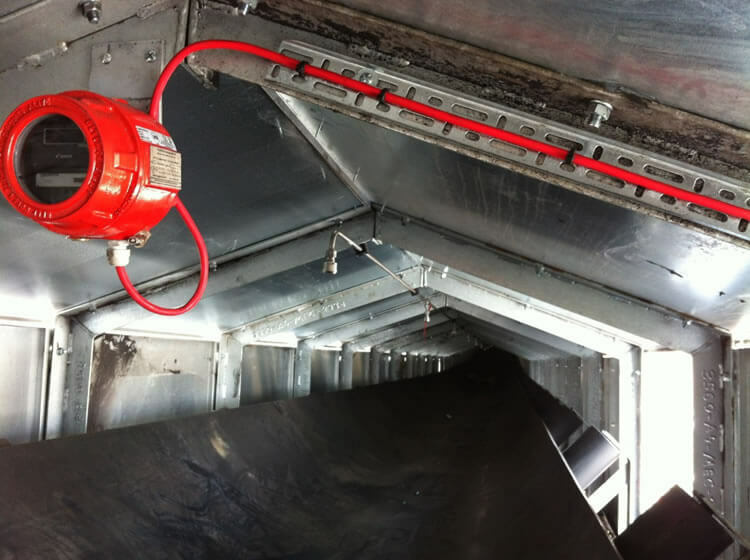 An example of one such application, a biomass conveyor in Liverpool Docks, is now protected from fire by a high-pressure water mist system, controlled under the watchful gaze of FFE’s Talentum IR3 flame detectors. The conveyor is part of a biomass handling depot constructed by energy supplier E.ON. Biomass, plant-based material that is not used for food, is increasingly used in electricity generation in the shape of small pellets created as by-products of the wood and agriculture industries. 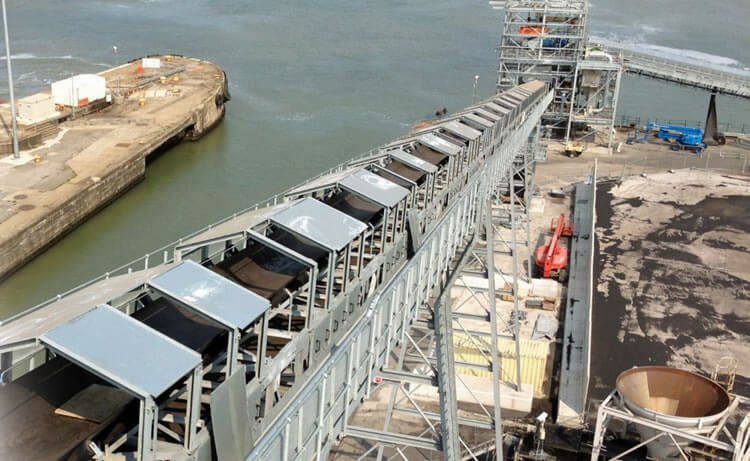 The conveyor, with an overall length of over 700 metres, carries the biomass pellets directly from the hold of a cargo ship for transporting to a power station. Fireworks Fire Protection was commissioned by E.ON to design and install a fire protection system specifically for the conveyor. Due to the nature of the pellets, which can support both smouldering and flaming combustion, a high-pressure water mist system was installed. The conveyor was divided into zones, each equipped with a flame detector, control panel, valve and set of spray nozzles. Each zone panel was linked in turn to a site-wide addressable panel which triggers the water mist to operate in zones around the location of an alarm, and immediately stops the conveyor – essential if the fire is to be contained quickly. Rapid and reliable flame detection was clearly a critical design requirement, and so Fireworks selected FFE’s Talentum detectors to be used in the system. High levels of flammable dust were to be expected, which could not only obscure a flame but could lead to false alarms from smoke detectors, as well as giving a potentially explosive atmosphere. Rapid fire detection was needed to quickly activate the suppression system and prevent the fire from being carried further along the conveyor before being extinguished. Vents and gaps in the housing of the conveyor could allow natural or artificial light to penetrate the interior, again leading to potential false alarms. 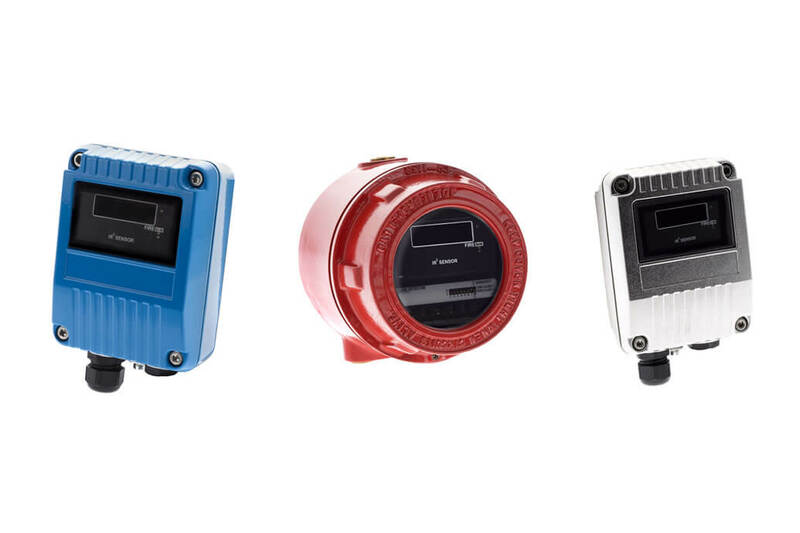 These challenges are common to many industrial environments, but fortunately the flameproof Talentum IR3 flame detector is designed to cope with all of them. Three infrared sensors in the unit can detect flames through dust, steam or smoke. An in-built algorithm analyses the shape and variation of the IR signals to determine if they match the characteristic flicker of a flame. Finally, the sensors each respond to different wavelengths in the infrared region of the spectrum, with FFE’s broad spectrum technology precisely distinguishing between a flame and other sources of radiation such as ambient and artificial lighting. The flameproof (or Exd) version of the Talentum IR3 detector was chosen for two reasons. Firstly, it prevents any chance of a spark from the detectors igniting the explosive dust. Secondly, the rugged IP66-rated casing provides the detectors with exceptional protection from water and dust ingress in the relatively harsh working conditions. Thanks to this intrinsic protection and the ability of infrared detection to be effective in dusty environments, it was possible to mount the detectors inside the conveyor housing, which provides the fastest possible detection of a fire in each zone. This was illustrated by igniting a small burner flame approximately 7 metres from the Talentum detector. Within 15 seconds of the flame being ignited, the water mist system was activated. Although not critical in this instance, infrared flame detectors can also detect flames from a wide variety of fuel types, and so would be ideally suited for protecting infrastructure in energy generation schemes using other waste materials such as plastics. When conditions make smoke detection difficult or unreliable, consider the alternatives. Infrared flame detection, in the form of the FFE Talentum IR3, is the ideal detector for dusty and hazardous environments due to its robust construction, false alarm immunity and speed of flame detection. FFE is a global design and manufacturing business, dedicated to supplying specialist detection products to the fire industry. Its two leading brands are the Fireray optical beam smoke detector, with over half a million units installed worldwide, and the Talentum flame detector, one of the world’s most respected flame detector brands. For more information visit the FFE website.